The NRL State of Origin is one of the most fiercely fought and popular sporting events in the country. It is of special significance to New South Wales and Queensland people because these are the 2 states that play for bragging rights in this best of 3 match series. These NRL rugby matches are played on Wednesday nights during the middle of the NRL premiership season and there is a real grudge held between the participants and fans of the two states. 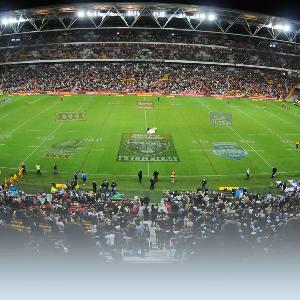 Due to the fact that the NRL State of Origin is so popular and many people travel from interstate to see the spectacle then you will find that all of the hotels, motels and serviced apartments in Sydney will book up well in advance.o make sure that you book your NRL State of Origin accommodation early. From the Southern or Eastern suburbs catch a train to Richmond Station and then walk 400 metres to the ground. From Northern suburbs catch a train to Jolimont Station and then walk 200 metres to the ground. From the Western regions catch a train to either Flinders Street or Parliament Stations and from there you can either take a short tram ride along Wellington Parade (route 48, 71 or 75) or walk the 1 kilometre to the ground. The best way to get to the ANZ Stadium which is conveniently located in the Sydney Olympic Park precinct is to catch public transport. You can either catch a bus and get off at any one of the stops surrounding the stadium or catch a train directly to the Olympic Park train station. It is then just a short walk to the ANZ Stadium. You can also drive your own car to the area as there is ample car parking surrounding the stadium. Situated in the heart of the Parramatta's business & shopping district the Fiori Apartments have a choice of fully furnished studio, one and two bedroom apartments complete with balconies. The Fiori Apartments in Parramatta is conveniently location just a short distance away from the CBD, railway station, Westfield Shopping centre, Chinatown, restaurants, cafes, schools and parks. The APX Apartments Parramatta is located opposite Rosehill Gardens Race Course and has a selection of quality 1, 2 and 3 bedroom serviced apartments the are ideal for both overnight and long term stays. The APX Apartments Parramatta is ideally situated only 2 kilometres from the Paramatta CBD, Westfield Shopping Town and a short drive away from Homebush Bay, Olympic Park and ANZ Stadium. Budget conscious travelling staying in Western Sydney near the Olympic Park will love the Sleep Express Motel. The property is a newly built motel offering budget hotel accommodation just ten minutes away from Acer Arena, ANZ Stadium, Sydney Showgrounds, Stadium Australia, Sydney International Aquatic, tennis centre and the Sydney Superdome at Homebush. The afully self contained apartment accommodation at the Caulta Apartments in Parramatta is ideal for people attending sporting events like the NRL state of origin because the furnished apartments have everything that you will need for your stay, including spacious living areas, verandas, fullly equipped kitchens and an internal laundry. The accommodation at the Mantra Parramatta is the ideal choice when mixing business with pleasure because it is just minutes from ANZ Stadium, the Olympic Park at Homebush Bay and Parramatta's thriving business and retail centre. The Mantra Apartments in Parramatta has a number of spacious studio, one bedroom apartments and spa rooms all with premium facilities and services that make you feel right at home.